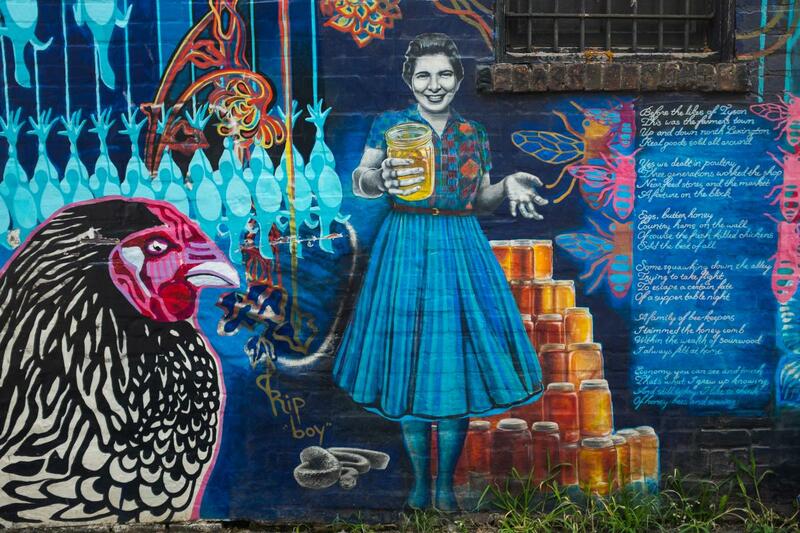 Asheville is where creative types go to find their mojo. It’s where they not only stand out but fit right in. You will discover art in this community is woven into every neighborhood, brushed across every building. Alleyways, water towers and underpasses are our canvasses. Glass blowers, potters and wood carvers are the characters who illustrate our story. That story is steeped in tradition that dates back to Cherokee crafters and Appalachian artisans. Our artists are also pure visionaries on the cutting-edge of their medium, hammering out designs on the newest technology. 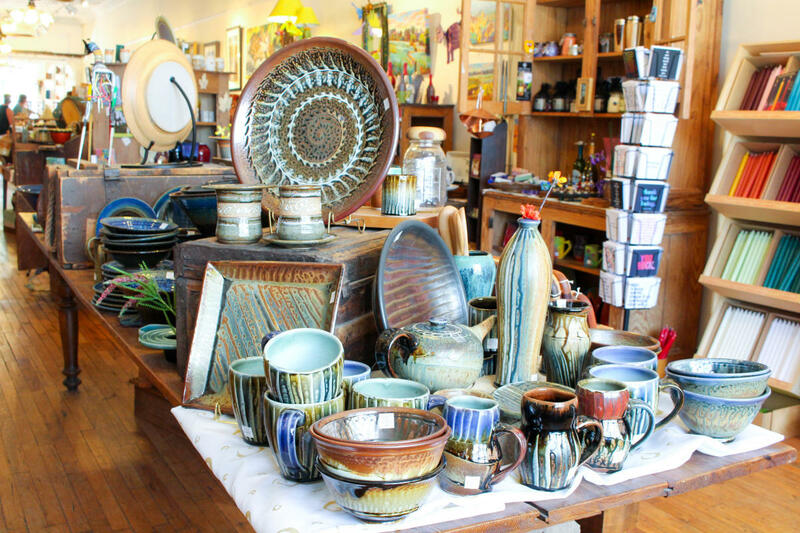 From ceramics to basketry, jewelry making to sculpture, glass-blowing to furniture making, they do it all. And as they work, Asheville artists are uniquely welcoming. They want you in their studios. They invite you to create alongside them. The resulting mix is a vibrant palette of galleries and workshops where dazzling creativity thrives. Quirky crafters aren’t hidden away in the Asheville area. They are celebrated on public display, just like the art they create. You’ll find the widest array of artists in the city’s burgeoning River Arts District (it’s nicknamed RAD for a reason). There, they’ve transformed old factories, industrial warehouses and historic buildings along the French Broad River into a patchwork quilt of working studios where the doors are seemingly always open. At every turn you’re in for a surprise. Through a lifted garage door at the Asheville Glass Center, the glow of fired glass catches your eye. Through the open window of Curve Studios, the sound of a spinning pottery wheel travels to your ears. As you take it all in, grab a beer at The Wedge Brewery or feast at local staples like 12 Bones Smokehouse and White Duck Taco. Then, it&apos;s your turn to create by taking advantage of expert-led classes and workshops. Discover your stroke at River&apos;s Edge Painting Studio or enrich your penchant for sculpting at The Village Potters. Art isn’t all down by the riverside. Within a half-mile radius of the heart of Asheville, you’ll find a series of pristine studios and showrooms that give the Downtown Arts District that “Paris of the South” identity, enhanced by surrounding trendy boutiques and open-air cafes. 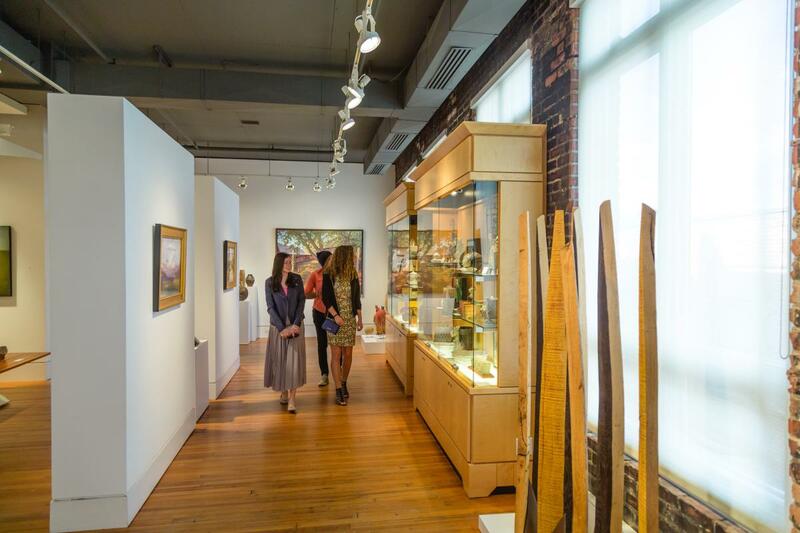 Two museums, the Black Mountain College Museum + Art Center and the Asheville Art Museum, anchor the growing urban arts scene. Newly-expanded spaces at both museums aim to bring art—both past and present—to the forefront of the city’s center. The nationally-recognized Center for Craft, Creativity and Design on Broadway Street serves as an educational jumping off point. This is Asheville, winner of the BeerCity USA poll four years in a row, so beer must enter into this equation somewhere. 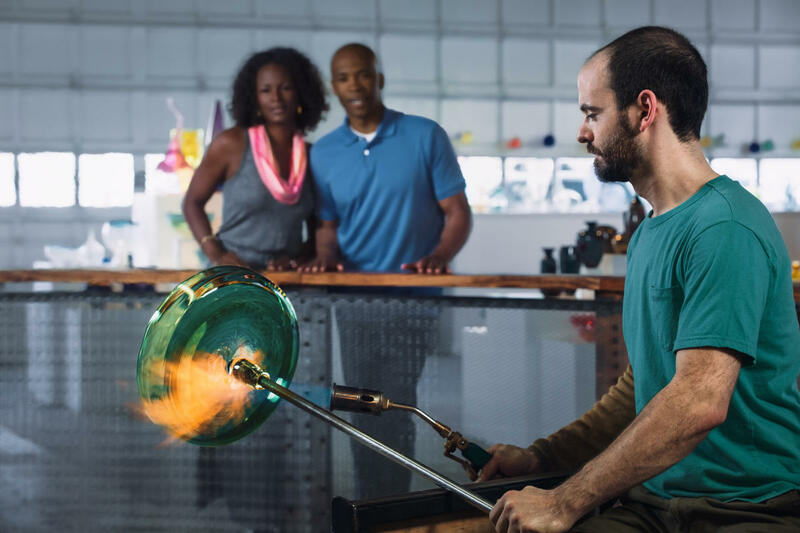 Downtown&apos;s Lexington Glassworks has engineered a bluegrass music jam where you can drink a cold craft beer in a hand blown glass on first Fridays throughout the summer. Return for a class designed to help you breathe life into your very own beer glass. How about history and art? Stroll through the Biltmore Estate, a work of art in its own right, to see meticulously-restored antiques and carefully-manicured gardens. How about a mix of the outdoors and art? Yes, we have that too. Just minutes outside of town on the Blue Ridge Parkway is a must-see stop. The Folk Arts Center shows off the finest in traditional mountain crafts. Head just a little farther down the road and you&apos;ll find yourself in charming Black Mountain. Art lives on every corner, literally, thanks to a series of inviting, hand-decorated rocking chairs strewn throughout the town. Pull up a chair or as you wander the local galleries, or a create-your-own-ring workshop at Visions of Creations and take home a one-of-a-kind souvenir. This area is also home to art you can’t help but happen across. Of course, it has that Asheville twist. A giant sculpture of an iron at the intersection of Battery Park and Wall Street and the not-so-garden-variety mural of attitude-laden chickens in Chicken Alley off of Woodfin Avenue enliven the downtown streets. The art community in Asheville isn&apos;t resting on its (mountain) laurels. Artists have decorated the calendar with a series of events to inspire you throughout the year. The River Arts District offers a semi-annual Studio Stroll – essentially a giant open house. It’s your chance to chat up the artists, see them in action, and get your own hands dirty with specially-designed workshops. Downtown Asheville offers its own Art Walk on the first Friday of every month, April through December. Twice a year is a local favorite, the Craft Fair of the Southern Highlands, which gives more than 200 juried members of the Southern Highland Craft Guild the opportunity to showcase their skills. The show kicks off its 69th year in mid-July and comes back for more in October. And, then there&apos;s the Big Crafty. A giant indie community bazaar, also set up twice a year, that features all things handmade. Head north from downtown to explore another semi-annual adventure; the Weaverville Art Safari’s self-guided studio tour takes place in May and October. Or look east to Black Mountain for a well-juried craft show along small town streets in June and October. With so much to see, Art Connections Tours is happy to do all the planning for you. The group develops thoughtfully planned custom itineraries to connect art lovers with the who’s who of the area’s finest makers. In other words, no matter how you enjoy delving into the creative experience or what medium speaks to your soul, you&apos;ll find it here. And the artists&apos; doors will remain open, beckoning you to your next Asheville art adventure.